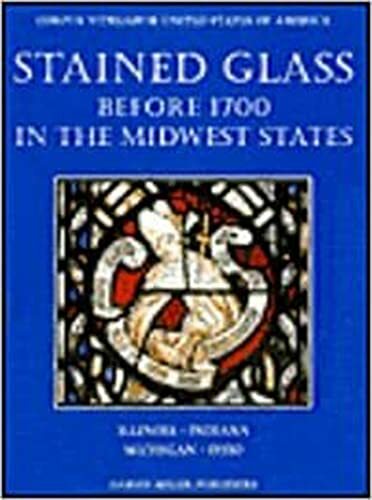 Stained Glass Before 1700 In The Collections Of The Midwest States 2 Vol Set: 9781872501000 Hardcover - LIMEROCK BOOKS INC. This, the first publication in a major new ten part series, forms part of the international Corpus Vitrearum. It catalogues almost 200 panels of stained glass from collections in the Detroit Institute of Art; the Art Institute in Chicago; the University of Michigan Museum of Art, Ann Arbor; the Cathedral Church of Saint Paul in Detroit; Cranbrook Academy of Art Museum; the Edsel and Eleanor Ford House; and, in Ohio, the Cleveland Museum of Art and the Toledo Museum of Art. The introduction examines the nature of stained glass, its function as an art-form, and its relationship to architecture and other art-forms of the medieval and Renaissance periods. A discussion of the formation of the collections yields fascinating information on the history of changing tastes, the social status of collectors, their attitudes toward religion, and the development of public museums in the 19th and 20th centuries. The catalogue provides comprehensive contextual, iconographic and stylistic descriptions. Every panel is illustrated, with restoration charts and several details, as well as comparative examples. This volume is part of set 1-872501-00-1 (2 volumes) and can only be ordered as part of a so-called set. The first publication of the U.S. division of the international stained glass organization Corpus Vitrearum, this catalogue offers a thorough, while mainly academic, analysis of medieval European stained glass currently housed in the American Midwest. Detailed provenance descriptions trace the paths of stained glass roundels and panels, explaining the mystery of how each object made its way across the ocean to collections in Illinois, Indiana, Michigan and Ohio. Descriptions of technique segue into those of style, giving a framework in which to view the piece, discussing such methods as the painting of fabrics, as in the elaborate &quot;damascening&quot; of clothing one influential artist, Arnoult de Nimegue, used around 1490. For medieval buffs, the sections delineating the iconography of heraldry will be art historical candy: the explanation of the &quot;Order of the Garter&quot; on a heraldic panel from the Detroit Institute of Art notes, &quot;The most commonly repeated story of the origin of the name is that at a court function a lady may have dropped her garter in the midst of a hectic and crowded assembly.&quot; In another work &quot;Barbara&quot; holds a tower in one panel because her father had imprisoned her in one, &quot;hoping, in vain, to prevent her from being indoctrinated into the Christian faith.&quot; (The entry goes on to explain how a priest disguised as a doctor secretly instructed her in the faith and her father then had her beheaded.) Of the 570 illustrations, there are, unfortunately, only a handful of color plates, although each black-and-white print is coupled with a description of its colors. Regardless, this is a unique catalogue that also gives insight into how collectors of stained glass in the United States have evolved in terms of their taste and status.<br />Copyright 2002 Reed Business Information, Inc.